Just 7km south of Thailand’s sea border with Myanmar (Burma) and 80km west of Ranong province on Thailand’s west coast is the Surin Islands National Marine Park. There are two main islands in the marine park, they are Surin Nua (North) and Surin Dtai (South). There are also three smaller islands, Koh Pachumba (Dragon Island), Koh Chi (Nun Island) and Koh Torinla. Then there are two exposed rock outcroppings called Hin Gong and Hin Rap. There is a national park HQ on the islands plus a village of the nomadic sea gypsy tribe known as Moken or Chao Ley. Otherwise the islands are uninhabited, no resorts here. Fewer dive boats visit this area despite many of them advertising that they do. Often when a liveaboard company says that they visit the Surin islands they are actually referring to Koh Bon and Koh Tachai islands (which are south of Surin islands and actually located within the Similan Islands national marine park) plus Richelieu Rock which is part of the Surin Islands national park. The Surin Islands diving season is November to the end of April when the sea should be flat and the weather fine. November-December can see some wind. February to April is the best time to spot large pelagic species like Whale sharks and Manta Rays. Boats are advised not to visit the area from May to the end of October when waves can make travel hazardous. Because fewer boats make the trip to Surin it is sometimes thought that Surin islands diving is inferior to Similan Islands diving but that is not the case. It is true that the visibility is not always as good around the Surin islands and that in the past dynamite fishing was a problem in Surin. But the park is now protected and you will find species here that are not common elsewhere in Thailand such as Napoleon Wrasse, Bumphead parrotfish, Tomato Anemone fish and Yellow Mask Angelfish and the Andaman jawfish which you won’t find anywhere else and can sometimes be seen protecting hundreds of eggs in it’s mouth. Divers that do make it this far north are also pleasantly suprised by the excellent macro critters to be found such as Harlequin Ghost Pipefish, Sea Horse and Robust Ghost Pipefish. Choose a slightly longer liveaboard trip that has time to reach the Surin and you’ll be pleasantly surprised by the diving and the tranquility away from the masses. Surin is also ideal for snorkelers as many of the reefs start at very shallow depths. Surin, like most islands in Thailand also boasts spectacular beaches and bays. There are also mangroves and, on the main islands, lush evergreen forested interiors. The national park rangers have set several trails that you can walk through on the look out for crab eating Macaques, squirrels, deer and flying foxes. Bird watchers can see Hornbills, Nicobar pigeons, Kingfishers, white bellied sea eagles and kites. One of the most popular dive sites around Surin is Koh Torinla. On the east coast of Torinla Island a hard coral reef, mainly staghorn coral, runs north to south not far off shore. Liveaboard boats more up at one of several mooring buoys along the length of the reef and divers make a very relaxing dive from one end to the other. Visibility is usually excellent and currents weak. Fish life on the reef is prolific and includes cardinal fish, snapper, angelfish and bannerfish. Spanish Mackeral and Grey Reef sharks can be spotted on the reef edge and, if you are lucky, so can Eagle Rays. Schools of barracuda are common but one of the most popular fish on the dive are the long nosed batfish that always seem to be hanging around the moorings, checking divers out as much as divers are looking at them. Larger pelagics like Giant Barracuda, Tuna, Mackeral and Trevally can be seen in the currents at Koh Chi. Turtles are also common here. Hin Rap also has turtles. On the west side shallow reefs are excellent for snorkelling. On the east side the boulder formations drop off deeper and larger pelagics can be spotted. 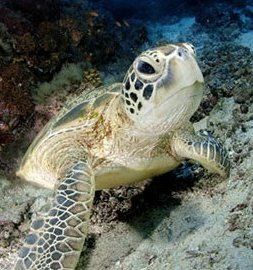 Turtles are also common on the south east side of Koh Surin Dtai along with oriental sweetlips, parrotfish and many other schools of tropical fish. 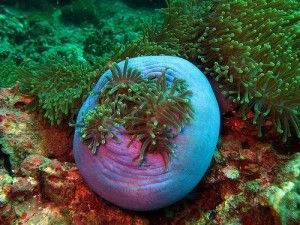 Anemones are protected by Clark’s Anemone fish and the occasional reef shark can also be spotted. This is a popular night dive spot.